An introductions to Indian food via the masala box. Every Indian family will have one of these boxes. Traditionally they came in steel, but with advancing commercialisation, we’ve progressed to Tupperware! This is perhaps the most widely used spice in Indian cooking. It has a distinctive and slightly pungent aroma and can be made by heating cumin in a iron pan and then powdering it. Cumin powder is also added on cut fruits to add flavour or in buttermilk. Cumin has digestive properties and a must have in most homes. This spice is known for its woody, flowery aroma. Often this powder is mixed with cumin powder in 1:2 proportion and used to thicken gravies. Apart from its digestive properties, coriander is not just a cooling spice but also very high in iron. An omnipotent spice in the Indian kitchen. Most Indian homes have two different kinds of chilli powder, one the bright and non spicy kashmiri chillie powder and the other the spicy an darker bedki powder. You can choose the chillies of your choice depending on the heat you want to generate in your dish. Turmeric and India have a long history. This imparts the rich flavour and colour to a lot of dishes. But is also used for its medicinal values. Its antiseptic, helps fight cancer cells and also helps soothe a sore throat . No family will give you the family recipe, and yet each version of it is flavourful. The main ingredients–cloves, cinnamon, mace, nutmeg, star anise, cumin, coriander and black pepper corms–are roasted in an iron pan and ground to make this masala. The proportion of spices used is responsible for the final taste. The vaghar or tempering of entrees is incomplete with 5 spices, cumin is one of them. The second must have spice for the tempering. 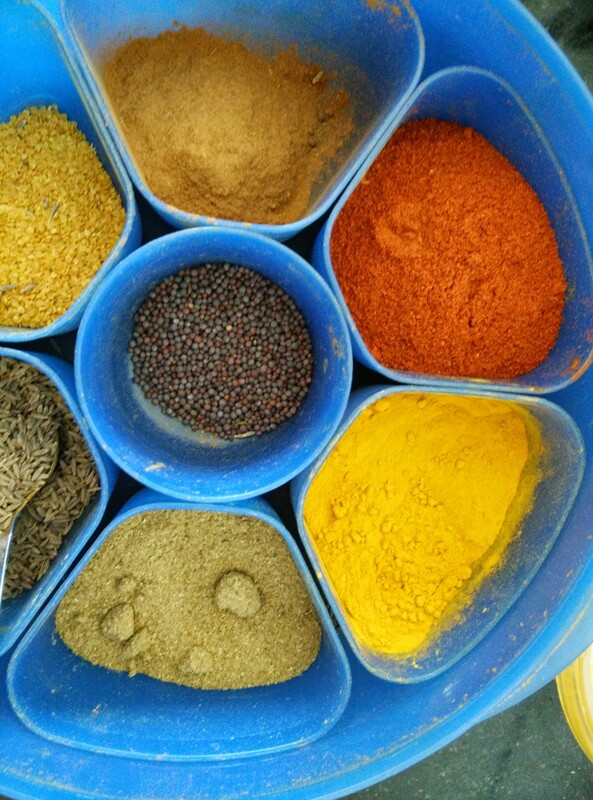 Different homes have different coloured mustard seeds–black, brown or yellow–each one imparts a different flavour and heat. What’s more some parts of India grind these seeds and use it in pickles too! These brown squarish seeds are bitter to taste, but a must in Gujarati and south indian food. They are also excellent pain relievers for stomach problems.